President Donald Trump will order staff to pinpoint countries and goods responsible for America's nearly $50 billion trade deficit. WASHINGTON: President Donald Trump will order staff Friday to pinpoint countries and goods responsible for America's nearly $50 billion trade deficit, in a protectionist warning shot to trade partners like China. Top administration officials said Trump will issue a pair of executive orders aimed at rooting out the causes and culprits behind America's trade deficit, in a first step toward converting tough trade rhetoric into action. Commerce Secretary Wilbur Ross said one order would result in analysts going "country by country, and product by product," reporting back to Trump within 90 days. They will look, he said, for evidence of "cheating," inappropriate behavior, trade deals that have not lived up to their promise, lax enforcement, currency misalignment and troublesome World Trade Organization constraints. "It will form the basis for decision making by the administration," he said. The order comes a week before Trump meets Chinese President Xi Jinping and is likely to be seen as a warning shot across Beijing's bow. "Needless to say the number one source of the deficit is China," Ross said, before listing more than a dozen other "countries that will potentially be involved." The others listed were: Canada, France, Germany, India, Indonesia, Ireland, Italy, Japan, Malaysia, Mexico, South Korea, Switzerland, Taiwan, Thailand and Vietnam. However, Ross said the presence of a deficit does not necessarily mean that retaliatory or remedial action would be taken. "It's a little bit hard to say that someone is an evildoer if they are providing a product we can't," he said. "In some cases, it will simply be that they are better at making the product or can do it far cheaper than we can. "This is not meant to say that everybody on this little list is an evildoer." "We've under collected 2.8 billion of these duties" said Peter Navarro, a top Trump trade advisor outlining the plan. Under the proposals being considered US customs officials could impose more substantial bonding requirements at the border or examine products' risk. Listing various problem areas, Navarro said: "This is a big deal. It's steel, chemicals, agricultural products, machinery -- it's the whole gambit." Germany protested over planned US punitive anti-dumping duties on steel plate products from companies in that country and six others. German Foreign Minister Sigmar Gabriel charged the step breached global trade rules and unfairly disadvantaged suppliers in Germany, as well as in Austria, Belgium, France, Italy, Japan, South Korea and Taiwan. Italy also voiced alarm, amid fears that products like Vespa scooters could be hit by punitive duties. "Trump declares war on the Vespa" said a headline in national daily Il Messaggero, reflecting the tone of most of the media coverage on an issue that dominated front pages and topped news bulletins. The European products are vulnerable to potential measures because of a transatlantic dispute over Europe's ban on beef produced with the aid of hormones that pre-dates Trump coming to power. Along with mopeds, the symbolic Italian products that could have punitive duties slapped on them reportedly include tomatoes in every form, salami and Parma ham, and San Pellegrino mineral water, now owned by Switzerland's Nestle. Ross, formerly on the board of steel and mining giant ArcelorMittal, said Thursday the foreign producers were selling their products at unfairly low prices in the US market and that US customs could therefore impose duties on the imports. 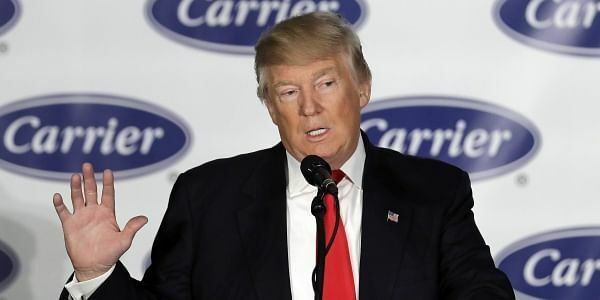 Throughout his presidential campaign, Trump had vowed to put America's trading relationship with the world on a more advantageous basis and put "America first." Critics counter that although the United States runs a deficit with some countries, no nation has benefited more from current global trading arrangements than its only superpower. In a second executive order, Trump will order the government to look at ways the United States can better recover trade duties on products that are subsidized by foreign governments or dumped on the US market. Navarro insisted the new measures would fall within rules at the World Trade Organization, where some might see the United States erecting a technical barrier to trade. "There is no issue here," he said. "We've been collecting these duties -- we just haven't been doing it very well. The WTO is silent on the issue of incompetence."